Add cool air to your home…exactly where you want it. For those humid Cape Cod summers, Carrier’s line of ductless split air conditioning systems allows homeowners to add air conditioning without major ducted installation or unsightly window air conditioners. You pick the rooms—say, certain bedrooms or a living room—which need cooling at times during the summer. Robies installs a small wall or ceiling-mounted indoor unit, as well as a small outside condenser. All summer, your family can selectively use your Carrier units where you need cooling, when you need it. Call Robies for a no-obligation home survey. Ductless systems deliver complete comfort — no matter where the indoor units are placed. Want a cooler kitchen but a warmer bedroom? No problem. Because units can be controlled separately, rooms can be set to different temperatures. Carrier’s ductless systems are also great add-ons for houses which have existing furnaces or air conditioners but where a sunroom or live-in attic or garage is too hot in summer or cold in winter. 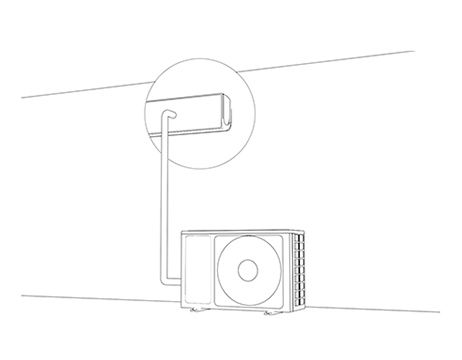 Robies can configure your ductless system to fit your needs, with installation that requires only a small hole in the wall to connect pipe from the indoor unit itself to the compressor unit outside. The outdoor compressor unit also provides power to the indoor unit, so there’s no need for additional indoor wiring. Carrier's ductless systems can be easily integrated into any home or summertime cottage. There are endless configuration options. In older homes, smaller homes, and off-season homes, ductless works where traditional HVAC doesn’t and offers easy solutions to eliminate those drafty hot or cold spots. Or fill in this form and we'll get right back to you. Robies’ staff includes some of the most knowledgeable technical professionals on Cape Cod. Factory trained, our employees keep up with the latest technological advances and building and local code changes and always obtain necessary installation permits. We have been serving Cape Codders for over 57 years, and back up our promises with a 100% Satisfaction Guarantee. No matter what your home comfort need, think of us.